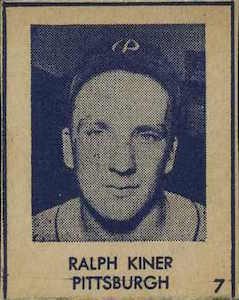 Ralph Kiner was one of the most prolific power hitters in the history of Major League Baseball. During his rather short career, he led the National League in home runs for seven straight years and finished with more than 350 dingers and 1,000 RBIs. This top ten list features Kiner's best cards, many of which come from some of the greatest sets of the "Golden Age" of baseball cards. Shop for Professionally Graded Ralph Kiner Cards on eBay. 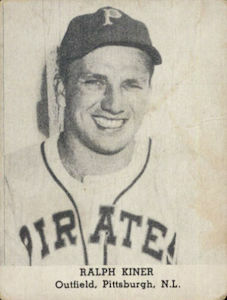 Ralph Kiner joined Pittsburgh Pirates during the spring of 1946 after returning from a stint with the Navy during World War II. During his rookie season, the outfielder led the National League in home runs with 23. Kiner's power numbers really ramped in 1947 after the Pirates brought in long-time Tiger Hank Greenberg to mentor his swing. He would go on to hit 51 home runs that season on his way to leading the National League for the second of seven consecutive seasons. In all, Kiner spent seven full years on the Pirates and was the home run leader in each of those seasons. 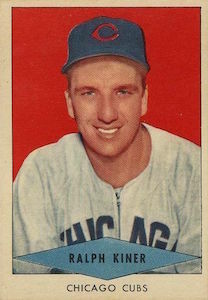 Ralph Kiner would spend his final two and half seasons with the Cubs and Indians, walking away from baseball at the age of 32 due to a back injury. He was inducted into the Baseball Hall of Fame in 1975 in his last year of eligibility. Kiner was still active around baseball after his retirement spending a total of 53 seasons in broadcasting, mainly with the New York Mets. The first cards of Ralph Kiner appeared in 1947 with a pair of rookies produced by bread companies that can be a real challenge for collectors to find. His first mainstream cards were produced in 1948 and 1949 when he appeared in both the Bowman and Leaf sets. Over the next decade of Kiner's career, he appeared in numerous baseball card sets produced by Topps, Bowman, and other oddball releases. Given his status as an elite power hitter, it is remarkable how affordable many of Kiner's cards are, especially given the popularity of many of the sets in which he appears. The top ten list below showcases the best cards of this popular Hall of Fame player. One of the most budget-friendly Ralph Kiner cards from early in his career is the 1948 R346 Blue Tint. These cards got their name from the blue print used during the printing process. The cards were issued in strips and many of them are hand cut making the edges and centering on the cards uneven. The highly-graded copies of this card can be costly, but the raw copies of this card are one of the real bargains of Kiner's cards. Ralph Kiner had several different certified autographs during the late 1990s and early 2000s. In fact, his autographs as some of the most inexpensive among the Hall of Fame inductees. His 2001 autographs were popular due to the fact that they feature on-card signatures in a Pirates uniform. The summer of 1955 was the last year that Kiner played in the MLB. He closed out his career playing for the Indians, but Bowman was the only major card producer to issue a card of Kiner that summer. There were several other star players who were also only featured in the Bowman set including Mickey Mantle, Whitey Ford, Roy Campanella, and Pee Wee Reese. This set is noted for being very affordable. The 1951 Red Backs set was one of the first baseball card products made by Topps. It was originally designed to be a card game, but collectors have enjoyed collecting this product as a baseball card set. There are a total of eight Hall of Fame cards in the Red Backs set and this card marked Kiner's first appearance in a Topps product. Like all of the Red Backs cards, Kiner's features bright coloring as a backdrop with a black-and-white photograph of the outfielder. One of the more unique card products of the 1950s, the 1954 Red Heart cards were given away as a mail order on packages of dog food. 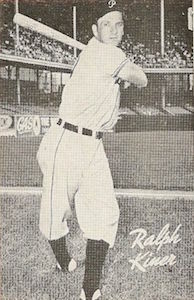 The set featured numerous Hall of Famers, including Ralph Kiner. 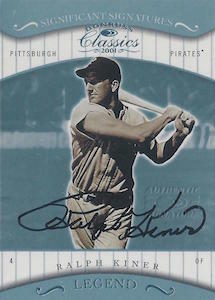 Although he did not have a Topps card in 1954, Kiner was featured in the Bowman set. However, the Red Heart card is considered his best card from that year since he appeared in the tough third series of the set characterized by the red background. 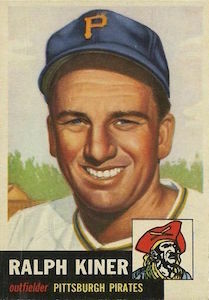 Ralph Kiner played two more seasons beyond the 1953 season, but his appearance in the 1953 Topps set was his final Topps card. In fact, the card is his only appearance in the flagship Topps set. The 1953 set is considered one of the real classics, in terms of Topps base sets, but the Ralph Kiner card from this product is still one of the easiest on the wallet when compared to other Hall of Fame subjects in the release. 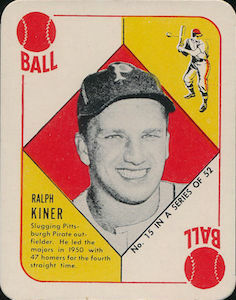 This pricey, early card of Ralph Kiner was a part of a 48-card set that was produced by Pennsylvania-based Bond Bread. There are loads of reprints that different companies have made over the years which have made finding the original copies of the card extremely difficult. Many of the reprinted versions of the card have been graded by defunct or obscure grading services. Collectors interested in collecting the Bond Bread cards will often pay a premium to find the cards at high grade from a reputable grader, not only for condition, but also to verify the authenticity of the card. The Tip Top Bread set is similar to the Bond Bread card. There have been numerous reprints of the cards, so collectors have put a premium on finding authentic copies of these cards. Eleven teams are included in this 163-card product which was distributed regionally. Although there are some notable players in the set, many lesser-known players are included in the release as MLB fill-ins during World War II. While Kiner was not a fill-in player, he was a younger player when this set was printed. 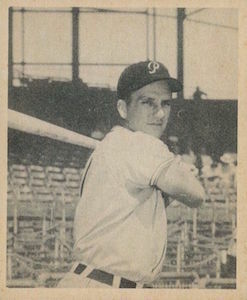 The Kiner card features a black-and-white photo on the front and included an advertisement on the back. As shown below, the cards did not offer crisp pictures. The 1948-49 Leaf set was one of the first mainstream baseball products and was issued by the Leaf Bubble Gum Company in Chicago. The product was noted for the bright vibrant colors which stood in contrast to the black-and-white cards of Bowman. 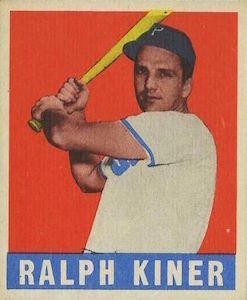 The skip-numbered set featured numerous Hall of Fame options, including one of the first widely-issued cards for Ralph Kiner. 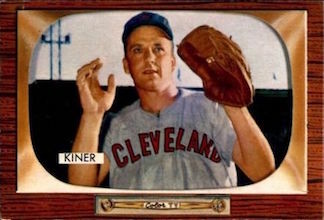 The colorful cards in the Leaf set showed off Kiner's blue Pirates uniform, which was the last year before the team switched to their current black-and-gold color scheme. The 1948 Bowman product is one of the all-time great baseball card sets. In fact, they were the first cards made for the sake of making a baseball card set. No tobacco or bread ads are featured on the backs of these cards. Although there were only 48 cards in the set, there are numerous cards for Cooperstown inhabitants and several important rookie cards. Even though the design is extremely simple, this is easily Kiner's most popular baseball card, and a must-have for any collector looking for his cards. 1952 Red Man with Tab Ralph Kiner Pirates HOF SGC 80 ! !